Many people are confused about the use of protein in weight loss. What is the role of protein in losing weight? What are proteins, why they are important and how they can affect our weight loss efforts? In one of our previous articles we talked about carbohydrates and weight loss and provided 4 diet tips for the role of carbs in any diet. In this article we will focus more on protein and try to explain why protein is necessary for a healthy weight loss. 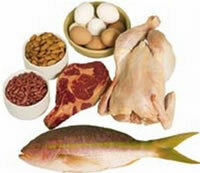 Proteins are usually known to be found in animal products such as meat, fish, cheese, eggs, yogurt etc. They are also found in tofu and soya products, and in smaller amounts in legumes. Proteins can be divided into essentials (can only get them from food) and non-essentials (can make them in our body). The quality of the protein we eat is very important as regardless of the amount of protein we consume if it lacks of essential proteins it could have negative effects to health. Proteins are essential for our body in all levels. We need them to build muscle, hormones, and enzymes, used for the immune system, bone tissue, organs and the list goes on and on. Protein is the last resort the body will use as fuel as it is very important for the body and will try to preserve it as much as it can. Protein is not stored as such as all protein in the body is active and in working component. It was very much believed that high consumption of protein could lead to kidney disease and liver disease. However, some recent studies indicate that although high protein intake makes the kidneys work harder, it does not necessarily lead to kidney disease in healthy humans. In general, research has not clearly shown that too much protein has adverse effects for health whereas too little protein can have fatal effects. Protein has the effect to make you feel fuller for longer, which in effect can help curb the snacks and have one more benefit in weight loss. 1. Quality can be vital. Quality of protein is determined by how easy can it be digested and how many of the essential amino acids (they make proteins up) they have. Some plant proteins are hard to digest and are incomplete. Combinations of foods provide the best solution. Diet should include a large variety of foods both from animal and plant sources. 2. Balance nutrients. Very high protein diets are usually recommended for athletes but not for everybody. Balanced diets in which protein, carbohydrates and fat are in equal or near equal amounts are usually the most recommended. 3. If you have any health problems, especially related to kidney dysfunctions and high cholesterol consult a medical professional before taking on any diet. 4. Increase water intake. Increasing the protein intake can lead to dehydration. Increasing water intake will help both the kidneys and avoid dehydration.